YOYOW is a Graphene based DAC for User Generated Content(UGC) , it will focus on Chinese market at the first stage. Founder, he is also the founder of hellobts.com, and managing the biggest bitshares QQ group and wechat group, a very innovative social media frontier. Co-founder, he is also the founder of transwiser.com, committee member of Bitshares and famous blockchain investor in China. Co-founder, he is also the R&D manager of YOYOW, a very experience Bitshares developer, the developer of bts-go,bts-go is a smartphone Bitshares wallet. He is maintaining the witness xn-delegate. Co-founder, he is also the moderator of Chinese sub forum on bitsharestalk.org and administrator of btsabc.org, plus, he is the local ambassador of openledger in China. Co-founder, he is maintaining the witness.still, a long time Bitshares supporters since very early stage. we have three more developers and many more marketing people that were not involved in Bitshares or has just entered blockchain industry recently. Angel investor and adviser in Bitcoin startups Bitangel including Btc123 Bitbank Bw Bither okcoin huobi LTC ETC Qtum Metaverse. As you can see, YOYOW is actually a product that unites most of the core players of Bitshares in China, and we believe that YOYOW will absolutely add much value to Bitshares too, at least it will be the propaganda front of Bitshares to the whole cryptocurrency community. So, what is YOYOW exactly? Although there will be many similar features between Steemit and YOYOW as both of which uses Graphene bottom layer, YOYOW is not a Chinese version steemit, YOYOW has its independent blockchain and its vision is far more than steemit. The biggest difference is that steemit intends to be a social media platform, but YOYOW wants to be a platform for other social media platform. I don't want to release too much details today, because the testnet is not yet online, and many features are still under discussion. I just want to say that, steemit is excellent, but YOYOW know Chinese better. Just like uber is beaten by didi, amazon is beaten by taobao, paypal is beaten by alipay, telegram is beaten by QQ&wechat, in one word, Chinese knows Chinese better. All text content such as articles, urls are storage on the yoyow blockchain, multi-media content such as images, videos will be storage on InterPlanetary File System (IPFS) network. The underlying architecture used by yoyow blockchain is Graphene that provides lightning fast confirmation speed which is essential to a blockchain-based content platform. yoyow has a system called "Council".The members of Council are elected by stakeholders of the platform. Except for generating blocks, etc. the Council also has the right of hiding content from the blockchain if the content violates the law. BUT the right can only be used when majority is reached in the Council. For any kind of social media platform and website, its value is always about website traffic. Platform carry information users needed. Traffic brings advertisement and profits to platform. So we believe user's value to the platform can be evaluated by how many effective traffic users brings to the yoyow platform, and at the same time, yoyow gives rewards to users that creating useful content which attract more traffic to the yoyow platform. Since there will be no English version at the first a few months, there was no marketing activities in English. That's why Iwe make this announcement just two days before the ICO. The main purpose of this announcement is to let the English Bitshares community know what we are doing. Though we indeed get a few reports in English media. Annual inflation rate: First year no more than 10%, then the inflation rate will decrease year by year. ICO will be carried out on four platforms --- Bitshares DEX(30 million), ICOAGE(80 million), ICO365(80 million), BTC9.com(80 million). 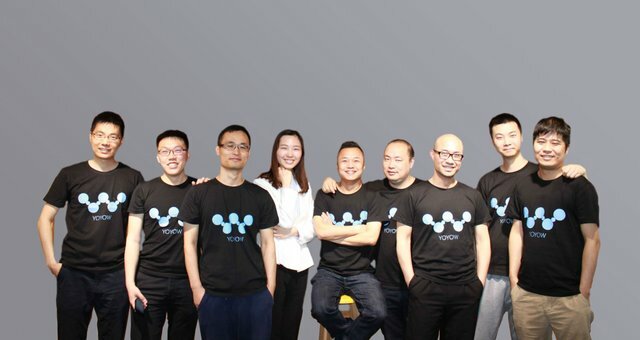 By the time I post this article, I have heard that the tokens distributed to btc9.com have nearly been sold out in forms of "reservation", even there are two days left before the official crowdsale starts, you can know how popular YOYOW is in China. For those who want to get some YOYOW, go on BitShares DEX: https://bitshares.org/wallet/#/market/YOYOW_CNY . You will need some CNY since YOYOW can only be bought with CNY. Look for BitCNY in the Dex. It's a Market Peg Asset. You can easily buy some BitCNY in the DEX. That's where you will discover the power of some Bitshares unique features (PMA, UIA). I will suggest u download Bitshares Dex because it would be easy to buy BitCNY with BTC in few minutes from Blocktrades. When u have BitCNY, you can then buy YOYOW. So Yoyow is the asset? questions: do you think the council censorship will be enough to prevent government censorship of entire yoyow platforms? Thanks for your question. The inappropriate content will be downvoted by shareholders and therefore not displayed on the UI side. 30% is for the first stage, among the rest 70%, only 30% belongs to team, while the others are reserved for third party platforms. almost all American social media are blocked in China. Is this also an issue for alternative Chinese social media, do you have to follow certain rules so that the government doesn't block YOYOW? I thought yoyow price is 1brc = 150k yoyo? Why in BTS DEX the price of 1btc is worth 93k only? 1BTC=150K was the ICO price, now all tokens in DEX have been sold out, and the price goes up. But I would suggest you buy from icoage, because there are some tokens left there at 1BTC=150K YOYO. Please post the exact URL for BTS DEX. I'll update the progress on steemit at every milestone. "propaganda front of Bitshares to the whole cryptocurrency community." What I don't understand, is you still left the word "propaganda" in the post. Why you not change it? All you did was say sorry and then left the mistake sit there :( Did you forget to fix it? Thanks, I will update the progress regularly. Oh wow! Great team for great product. I agree 100% not to try to be a steemit clone "... Chinese knows Chinese Better" Well said. I support the vision on building products/services that understand a market well and response to his need. Since it's planning to be a platform for other social networks, u will probably benefit from the upcoming EOS Project due to high level capacity the platform will bring to the market. Congratulation guys. Upgrade & follows. That's right, I think the whole Graphene family will all benefit from EOS. Is YOYOW the token on Bitshares? We issued the YOYOW token on bitshares chain, but finally YOYOW will have its own chain. No sharedrop? It's a great way to establish a large userbase early on. We have already given away about 1 million tokens on many Chinese communities. And the early participants will get some easy tokens, if you know Chinese. When can we get some of this on Open Ledger? You can buy it from bitcny:yoyow market at 1:00PM UTC time. I almost forgot about this! Picking some up on Open Ledger now! Hi, I'm living in Europe and I sadly don't smeak chinese. What would you advise to be sure to be able to buy some of your token ICO ? I'm worry about the time confirmation with BTC. Through Bitshares DEX BitCNY pair ? Will this way allow me to buy the first round and have the better price ? Bitshares DEX will be the best choice, because we have some discount there. But be sure to wait before UTC time 1:00 PM, as the tokens are limited. If I understood it well, tokens will be available there from 1 PM UTC (not before). Your team will create a big sell order I presume ? Hi! Potential US investor here. This looks super interesting, but had a few questions. Will this be an ERC20 token? Also, which exchanges do you anticipate this will trade on after the ICO? Thank you for introducing the word ERC20 to me. After I researched, I am afraid YOYOW will not be an ERC20 token. As it is not based on Eth, it is based on Graphene, it is Bitshaers like. Though I am not sure I understand ERC20 correctly. Hi! Why Binance exchane making deposit address ERC-20 (Ethereum) for YOYOW? Thanks! Thanks for the report, this is super interesting. I don't see the point. It would make more sense to just use the Steem blockchain and make an app on top of it. We have some different opinions about the default setting of bottom layer parameters so that we have to start a new chain. Also, there will be new stuff added. Would make more sense to make an app on Steem and add value to the existing chain. If everyone makes a separate chain for each country then all we have is more fragmentation. If you had good ideas for changes to the Steem blockchain they could have been submitted to the community for witness voting. It seems to me to be a cynical ploy for the founders to generate a lot of money - something which they would be less able to do if they used Steem. This way they own the tokens and sell them for large profits. At the same time, creating a new localized website, building a community around it, doing marketing and creating custom features for the local market is a lot of work. What would be their incentive to do it if it was only to make Steem whales richer? Steem is free software now, and so are Bitshares and Graphene. Let's not act entitled. We will benefit indirectly from the increased awareness of Bitshares, Graphene and Steemit in China. That's already good. Funny other people seem to be doing it without building a new blockchain - I thought it was a bad idea when Golos did it and it has certainly not improved. People can get paid via Steem or they could make a separate token like Zappl and some of the other projects are doing whilst basing the actual platform on Steem. What would be their incentive to do it if it was only to make Steem whales richer? Steem is free software now, and so are Bitshares and Graphene. Let's not act entitled. It's not acting entitled and I resent that statement - I honestly expected better from you. You know exactly what I am saying but it is obvious you have a vested interested in it so are unwilling to admit the truth. We will benefit indirectly from the increased awareness of Bitshares, Graphene and Steemit in China. That's already good. Maybe, maybe not. I've said my piece and time will tell if I was right or not. Can you please provide a link to the yoyow coin on Bitshares when it is ready? I see the market is already alive on YOYOW:CNY. How is that possible if you haven't started the ICO ? Wow! This is an awesome team! Lookig forward to see what you guys are up to. Will anyone of you be attending Consensus '17 in New York in a few days? Thanks for the quick response. Looking forward to see this one grow - great team! An excellent start, and very exciting! It is great to see your perspective and how YOYOW is tuned in to the eastern audience. IPFS is a great technology and glad to see you put it to use this way. I also agree with @xeroc that your team looks fantastic, and includes a wide range of different skills / talents. Thanks for your comments. I will update the results of ICO soon. BTW, yoyow is on sale on BTS DEX, but not Openledger.